Dana Vollmer was a baby when her mother taught her to swim, and it is no surprise that the future Olympian was a natural. 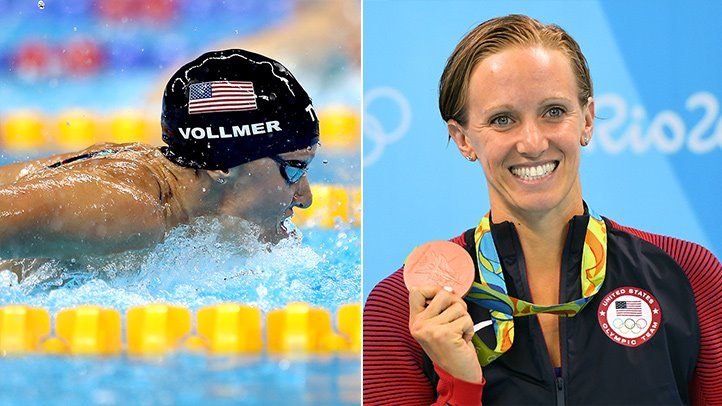 Throughout her youth, Vollmer achieved athletic success and saw a career as a professional swimmer building on the horizon. But when she was 14, her ambitions came to an abrupt halt when she was diagnosed with an arrhythmia. An arrhythmia is an abnormality in the normal sequence of electrical impulses in the heart. This can cause the heart to beat improperly and may hinder its ability to pump blood effectively. During surgery to correct an electrical path that was causing Vollmer's abnormal heartbeat, her doctors thought they discovered something much more serious: long QT syndrome. Long QT syndrome is a heart condition that is usually caused by a genetic abnormality in a ion channel in the heart. Long QT syndrome can increase the risk of sudden, rapid heartbeats in response to exercise or stress. And having long QT as a competitive swimmer could have put Vollmer at risk for fainting, seizures, or sudden death. Though Vollmer’s QT interval was longer than normal, it occurred at random times instead of when she was exercising. Her cardiologists were hesitant to issue an official diagnosis of long QT; however, they emphasized the potential dangers of having an arrhythmia as a competitive swimmer. But Vollmer wasn’t ready to give it up. Her doctors agreed to allow her to continue swimming as long as she had an automated external defibrillator present at every practice and swim meet. Vollmer trained hard to achieve her dreams without compromising her health. Though the defibrillator was always there, the thought of it slowly left her mind since she never had to use it. She has gone on to win 4 National Collegiate Athletic Association championships at the University of California in Berkeley, 7 Olympic medals, and 35 international levels in swimming. Today, Vollmer is on a mission to help women learn about their heart health and live their healthiest lives. As an ambassador for the American Heart Association (AHA) and advocate for CVS Health, Vollmer hopes to spread awareness about heart disease and empower women to take charge of their health. Heart disease is the leading cause of death in the United States. According to the World Health Organization, 80 percent of heart disease is preventable. To maintain heart health and reduce the risk of heart disease, the AHA recommends screening your blood pressure, HDL ("good") cholesterol, LDL ("bad") cholesterol, body mass index (BMI), and blood sugar level. Having high blood pressure greatly increases your risk of having a heart attack or stroke. If your blood pressure is less than 120/80 millimeters of mercury (mm Hg), the AHA recommends getting it checked once every two years. If your blood pressure is higher, you should meet with your doctor more frequently. A study published in November 2015 in the Annals of Internal Medicine suggests that adults 40 and older who have high blood pressure should get checked annually. The AHA also recommends testing your fasting lipoprotein profile, or cholesterol, every four to six years starting at age 20. A blood test measures HDL cholesterol and LDL cholesterol. High cholesterol is defined as 240 milligrams per deciliter (mg/dL) or higher and can lead to atherosclerosis, a hardening of the arteries caused by an accumulation of fatty deposits in your blood vessels. High cholesterol is often the result of unhealthy lifestyle choices, such as consuming foods high in saturated fats. Because high cholesterol has no symptoms, the Mayo Clinic recommends getting it checked with a blood test every five years. It’s also important to maintain a healthy BMI. A high or low amount of body fat can result in a number of weight-related diseases and increase your risk for developing heart disease. BMI is a way to measure how much fat you have in your body and is calculated by dividing your height in feet by your weight in pounds. According to the Centers for Disease Control and Prevention (CDC), a BMI less than 18.5 on the index is considered too low, 25.0 or higher is considered too high. A BMI above 30.0 places you in the obese category and increases your risk for a range of health problems, including heart disease, stroke, and diabetes. A study published in October 2017 in Circulation found that even a modest weight reduction of 5 to 10 percent can decrease blood pressure, reduce total blood cholesterol, and improve glucose tolerance. An arrhythmia diagnosis like Dana Vollmer’s is not uncommon for athletes. Arrhythmias are more common in older adults over the age of 65 than in athletes; however, there are a few exceptions that could have fatal consequences. “Sudden death in athletes is usually due to an unrecognized heart condition, which results in a malignant, genetic arrhythmia, such as long QT syndrome, hypertrophic cardiomyopathy, arrhythmogenic right ventricular dysplasia, etc.,” says Dr. O’Riordan. In the United States, more than 350,000 deaths occur as a result of sudden cardiac arrest each year. Importantly, youth athletes need to be just as cautious as adults. Athletes with a family history of sudden death and a personal history of fainting, seizures, or consistent or unusual chest pain or shortness of breath during exercise are recommended to undergo screening and examine the status of their heart health. Through her collection of Olympic medals and world records, Vollmer has shown that your dreams don’t have to be compromised due to an illness, yet she emphasizes that heart health is a top priority. In addition to getting your AHA numbers checked, making healthy lifestyle choices can prevent heart disease and keep your heart healthy. “Heart disease is mainly due to our lifestyle and physical inactivity that leads to the development of atherosclerosis,” says O’Riordan. Eating nutrient-dense foods instead of foods high in sugar, simple carbohydrates, or saturated and trans fats can help keep heart disease risk factors at bay. MyPlate is a Department of Agriculture digital tool that helps you see which food options are nutrient dense, how large your portions of these foods should be, which foods to avoid, and other resources like how to read nutrition labels. In addition to eating healthy foods, exercise is important for reducing your risk of developing heart disease. The CDC recommends 150 minutes of moderate exercise or 75 minutes of high-intensity exercise per week.